Well, it was a VERY long week last week. I knew it would be, but you just don't realize the full extent of getting ready for a stock show until you are in the throes of it. 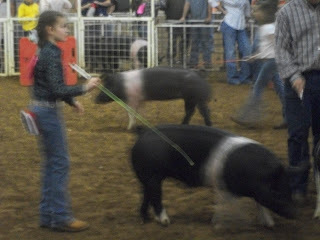 Admittedly, I didn't even do very much to help get the pig ready for the show. Kevin and Abby were in charge of loading him up in the trailer, hauling him to town, unloading him at the show barn, penning him, washing him, clipping him, walking him, feeding him, etc...I kept the boys at the house as long as I could, but 1) I was feeling left out of everything and 2) Byron couldn't stay away very long either. So, up to the coliseum we headed. The idea of having an open barn consisting of about 75% dirt was heaven on earth for my little 3 yr old. I lost him every time I turned around. 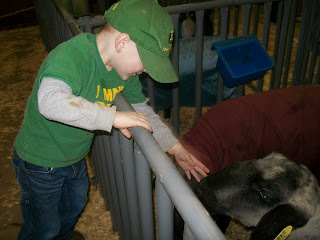 Collin was my main concern, although I did end up letting him play on the floor and in the dirt. Please don't judge me for that. I can only hold a 9 month old who is desperately trying to push away from me to get down on the floor for so long. He didn't put anything in his mouth or even get close to anything that would make even a farm mom cringe....I think.....but I am not going to dwell on that. You like the pig she described, the very pig she raised and you sifted her into LAST place?!?! Are you serious?!?! I couldn't believe it.... I still can't. But, in the end, what can you do? Really, all we can do is hope for a judge who thinks more like we do next time. And next time is THE BIG ONE--San Antonio. So we raise this pig for a few more weeks and pray for better results next time. So here are a few pictures from the weekend. Hope you enjoy!!! Byron loved when the lambs would start to nibble on his sleeve. One of the many, many, many times Mom told him to sit down. Collin had his own pen, but there was some complaint that there was no bedding in there. 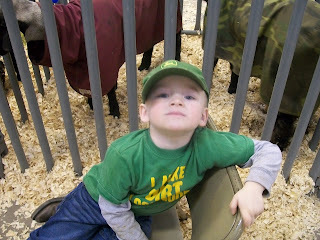 Well, not the pig kind of bedding.....But he enjoyed himself and drew MUCH attention from everyone. And this is how we felt after the week was over and then we decided to go to Abilene Saturday for a new washer and dryer! 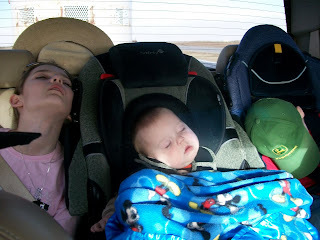 We are slowly working back into more sleep and the normal routine. Speaking of which....Good Night, All! 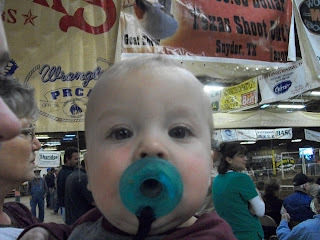 Was this at the Ft. Worth Stock Show?